With dates largely corresponding to the second quarter of the 19th century, the Philadelphia firm of Robert and William Wilson was a significant manufacturer, producing a wide array of silver flat and hollow ware. While modest and unpresuming in terms of function, size, and design, this pair of matching, 3 3/4" long, .5 T. oz. 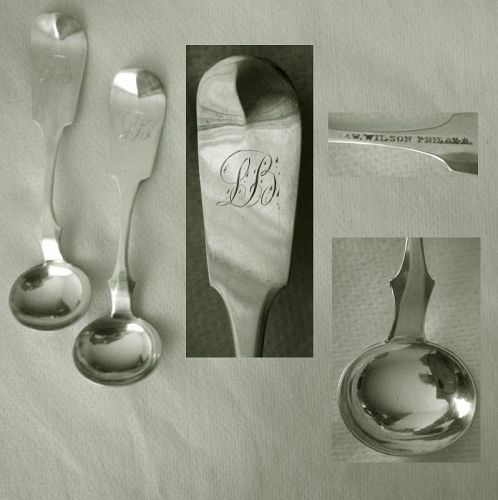 combined, master salt spoons nonetheless reflect the full quality of craft for which the firm was known. Contemporary maker K.M. Silver is listed in one source with dates 1982-2012, although a company website indicates a founding date of 1977. Judging from this example, which is a 5" long by 3 1/4" high to the rim, 5 1/4" to the top of the upraised handle, and relatively heavy at 5.2 T. oz., basket, the firm made high quality reproduction pieces. This would be a fitting size for candies or bon bons. Price for the two pieces. Without a formal name, but commonly referred to as "Peony" for the large, single, arched, blossom that appears on the end of the handle, this circa 1885 pattern is also characterized by its twist stem. The line is number "26," by Whiting, and this number, along with the company "lion" logo and "Sterling," appears on the backsides of this youth set, comprised of a 6 3/8" long fork and 5 7/8" long spoon, with a combined weight of 2.1 T. oz. Larger than most examples of this piece, measuring 5 7/8" long and weighing an exceptionally heavy 1.7 T. 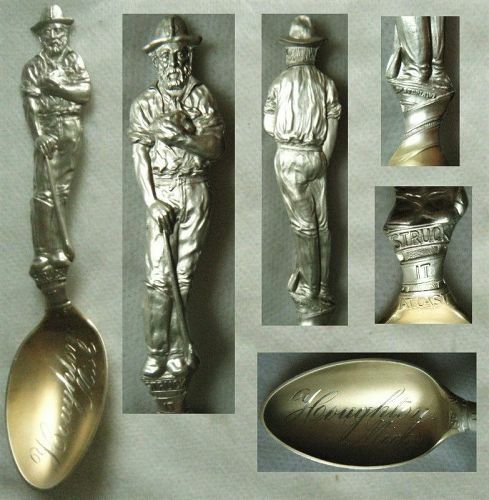 oz., this circa 1895 spoon was made by Watson, whose pennant emblem and the word "Sterling" are imprinted on the reverse. A souvenir item, the handle portrays a standing miner wearing boots and a hat, holding a chunk of ore in his left hand and with his right hand leaning on a crow bar or such. The figure is standing on a base that reads, "Struck it at last." 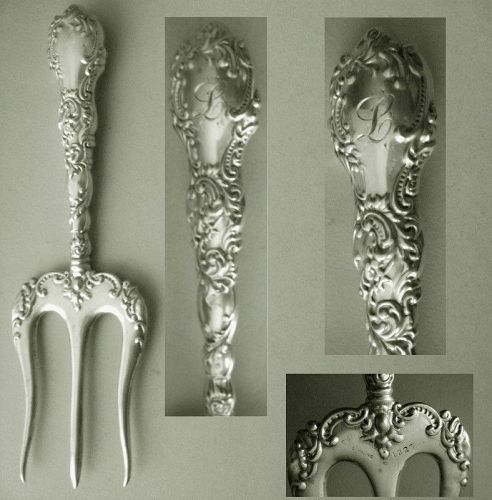 First appearing in Gorham's 1884 catalogue, offered as a set of twelve, "Number 3" oyster or seafood cocktail fork was illustrated in later catalogues (through the 1890s) shown with other exotic designs of the period (see image 2). The primary feature of the pattern is an apparent bat face situated at the end of the handle. This suggests some resemblance to a boar or devil as well. Other design details include wings, and possibly toes, wrapping around both sides of the handle. Measuring 3 3/4" long and weighing a robust 1.1 T. 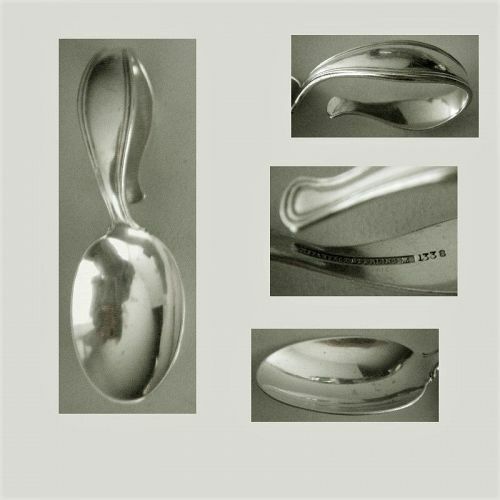 oz., this baby or infant spoon was made by Tiffany & Co. and is so marked, along with "Sterling," "m," and model number "1338." While not a line pattern, it has the plain, clean style of an Arts & Crafts piece, akin to Tiffany's "Gramercy" or "Hamilton," and, as do those pieces, likely dates from the second or third decade of the 20th century. The handle wraps around to form an open loop. Building upon motifs drawn from classical mythology, Tiffany's "Olympian" is a highly expressive and intricately rendered design. The theme on this 7 3/8" long, very heavy at just under 3.8 T. 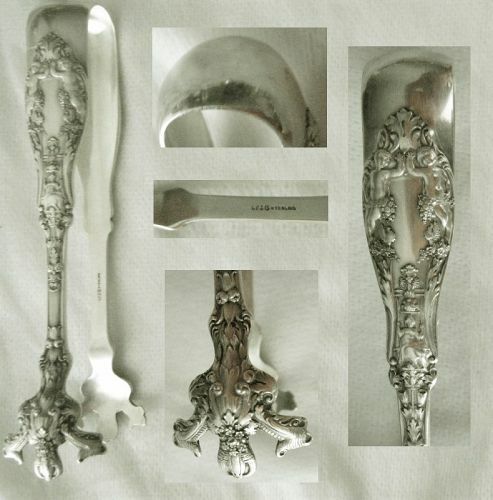 oz., gravy ladle is "Paris, the son of Priam," which was one of seventeen different subjects offered in this line (William P. Hood Jr., Tiffany Silver Flatware). It has a plain, oval, 2 3/8" by 2" by 3/8" deep, bowl, with a large classical face on the backside heel. 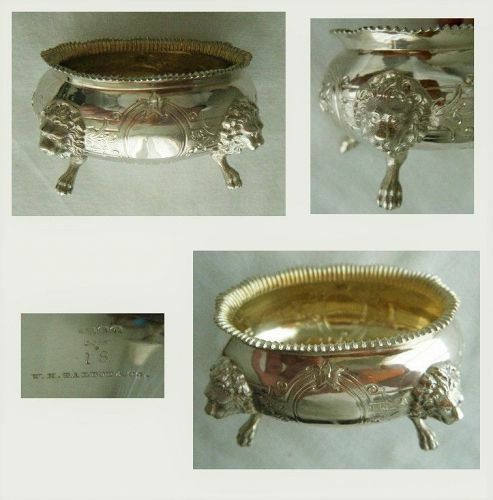 This item is a three piece, base, liner, and lid, coin silver, butter dish. The bottom measures 6 1/4" across, stands 1 1/2" high on a rimmed base, and weighs 5.9 T. oz. The fitted liner is 5 1/2" across and weighs 3.1 T. oz. Lastly the lid is also 5 1/2" wide, 2 3/4" high to the top, and weighs 6.3 T. oz. Relatively plain, the top has a cast cow finial attached by a threaded extension and thumb screw on the underside. Embodying a rococo pattern, and likely dating from the late 19th century, this 6 5/8" long, .9 T. 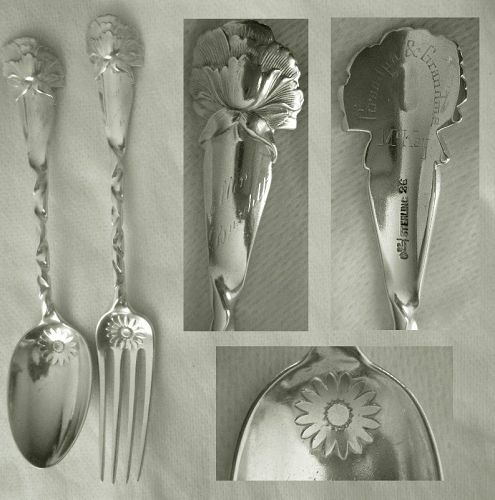 oz., bread or toast fork incorporates leaves, scrolls, acanthus leaves, and floral elements. It is hollow with three tines and is all silver, marked "Sterling," model number "1223," and with a maker's emblem, which is a triangle with a rubbed interior. There is a feathered script "L" monogram engraved on one side of the handle. Measuring 6" long and weighing a heavy 1.3 T. oz., this teaspoon is an early example of Dominick & Haff's figural, 1900 date of issue, "Labors of Cupid" pattern, the image on this being a cherub sitting at a table with a cup in hand. Lengthy at 5", and weighty at 1.7 T. oz., this pair of tongs are heavily ornamented in a way that is reminiscent of the dominant architectural style popular in the period of the piece. A large item, measuring 10 3/8" long and weighing nearly 2.7 T. oz., this solid silver ice cream slice was made by Frank Whiting in the "Palm" pattern. Introduced in 1887, and embodying an Aesthetic sensibility, "Palm" is a floral and leaf design with a large fan or spray element at the terminus that evokes a palm leaf. The design is raised, lending it a chiseled or sculpted quality. Measuring 5 7/8" long each and weighing 3.2 T. oz. the lot, each of these six spoons has a broad, tipt end handle with a twisted stem. The bowls are generously proportioned at 2 1/8" by 1 1/4" and have pointed tips. Weighing a substantial 1.6 T. oz., and measuring 7" long, this piece is variously identified as a place, dessert, or oval soup spoon. It is in a "French Thread" aka "Fiddle Thread" pattern and marked "J[ared].L. Moore" for the New York City jeweler and watchmaker working during the second quarter of the 19th century. 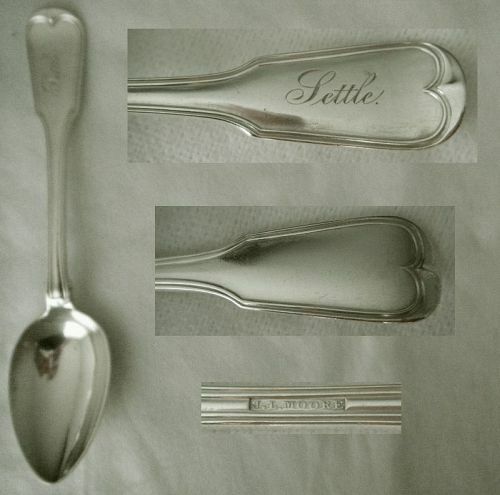 The name "Settle" is engraved in script on the handle front, set sideways. One of Gorham's earliest coin silver master salts, this is also an exceptionally fine example of the form. Model number "18," as identified on the underside, along with the rare "left lion" version of Gorham's hallmark, the word "Coin," and the name of the retailer, "W.H. Talbot & Co.," (more commonly spelled "Talbott") of Indianapolis. This is large, measuring 3" by 2 1/4" by 1 5/8" high, and robust weight at just over 2.4 T. oz. Made by and marked for San Francisco's Koehler & Ritter, this coin silver serving spoon measures a lengthy 9" overall and has a generously proportioned, 3 3/4" by 2 1/2", plum-shaped bowl. It weighs approximately 2.3 T. oz. The pattern is "Alameda" aka "Ivy." It strongly resembles Gorham's "Corinthian" of the same c. 1870 date, but with the addition of a spray of raised ivy leaves and berries set against a stippled ground.